Startup Days was launched today at High-Tech Park of the Ministry of Communications and High Technologies (MCHT). The main objective of the three-day event is to assist in the development of new start-ups in the country and develop the national startup infrastructure by providing them with information and methodological support in this area and promoting the development of the Internet business. 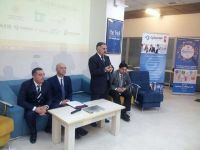 The Ministry of Communications and High Technologies, High-Tech Park, as well as companies Bakcell, Cybernet, Sinam, Khazar Ventures, and ATL Group give their support to the event. Opening address at the event was made by Osman Gunduz, the president of the Azerbaijan Internet Forum, who provided detailed information about the event. Speaking at the opening ceremony of the event, Deputy Minister of Communications and High Technologies Elmir Velizadeh positively assessed the holding of Startup Days as a new opportunity for young start-ups to come up with new ideas. “Through such kind of trainings students learn how to work in groups, and in the future it will help them build a successful business. We, in turn, as a state body are interested in supporting startups. Exit of young Azerbaijani start-ups to the international market and presentation of attractive products is a positive factor, which is an indicator of development,” said Deputy Minister. Elmir Velizadeh stressed that this year’s exhibition and conference Bakutel-2015 will create more opportunities for start-ups. Note that a conference on “The role of business incubators and universities in creating of new start-ups” will also take place as part of the Startup Days.